Looking out from the top of Nellies Glen. The Six Foot Track runs for 45km through the Blue Mountains, just to the West of Sydney and over the last three days we walked its entirety. About 100 years ago the Jenolan Caves were a major tourist destination, even more so than today. Geting there from Sydney generally involved a long train journey and then a ride in a coach or a walk. The train journey by-passed Katoomba and so the local burghers, worried about the business they were missing out on, got together and arranged to have a bridle-track cut. through the bush The idea was that people would get the train to Katoomba and then ride the remainder of the way. It never really worked; although the track became popular for a time with romantic walkers for a while before falling into disuse. In the last couple of decades, though, it has seen a resurgence – partly as a walking track, partly as four-wheel-drive access to camping grounds, and partly as a route for bikers. We caught the train up to Katoomba on Friday night and walked to our motel through the very worrying rain. Throughout the night the rain didn’t let up and we had visions of a damp walk; but the day dawned dry, much to our relief. A brief taxi-ride took us to the Explorer’s Tree (which currently should be called the Explorer’s plastic-shrouded, concrete-filled stump) which was our meeting place. Thanks to the long-weekend the group we were to walk with was larger than usual, but it quickly became apparent they were a pretty pleasant team. Our two guides were Merel , a vermillion-haired bundle of energy, and the tall, dry-witted, Greg, . 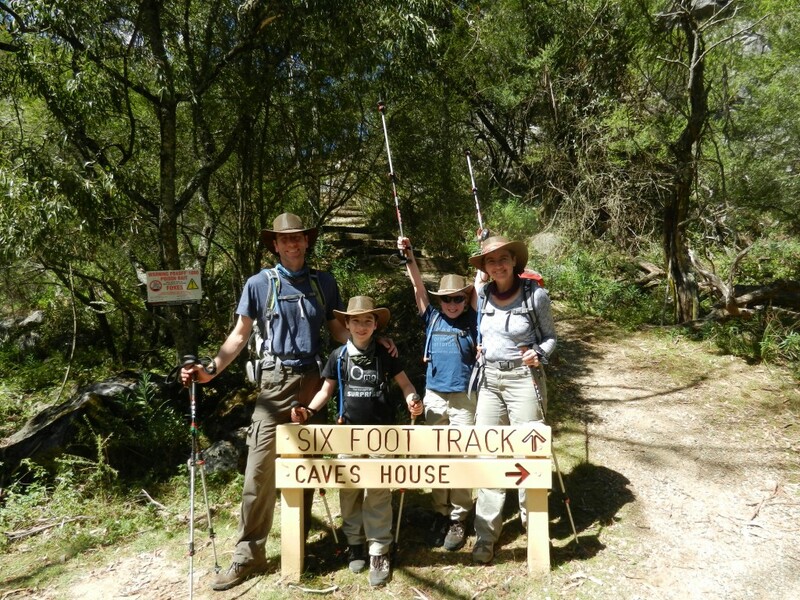 The first day’s walk was largely downhill from the escarpment through to the Cox’s River. The first few kilometres were on a path which was in no way six-feet wide. Merel explained the local council had bulldozed the track during the sixties, so the path was not indicative of what was to come. We’d had a few people warn us that the downhill was arduous; but, really, after Mt Gower earlier this year, it was a complete walk in the park. At the foot of the escarpment the track and the landscape opened up and we spent the rest of the day walking a pleasant track through the open woodlands and rolling fields of the Megalong Valley. Merel, it turned out, was a research biologist who had opted for a career change to become a guide and she was an absolute font of information so we learned more than ever before about the local flora and fauna (in spite of the fact that Merel’s field of study is whales). Callum kept track of our progress on his GPS and we went 17.3km that first day. 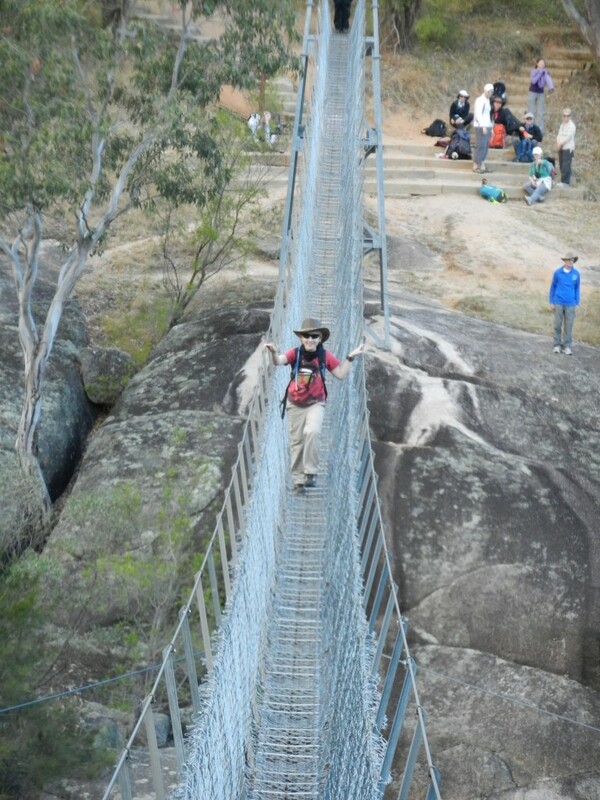 The exciting highlight near the end of the day was crossing the Cox’s River on a thin swing-bridge. The bridge felt like 100m of chicken-wire suspended from two metal cables and was a challenge for many members of our group. The boys, even Callum, handled it without batting an eyelid. I must admit I had a bad moment in the middle when my over-enthusiastic start got the whole contraption swinging in a nauseating fashion. We spent the first night in bunks in the Cox’s River Eco Lodge. A good meal around a camp-fire tended by Declan and warm sleeping bags made for a pleasant night’s sleep. The next morning was clear and cold. Callum and I were up first and sat chatting on the balcony while we watched wallabies quietly grazing and the Sunlight creep down the ridge ahead. After bacon and eggs for breakfast (this was not the sharp end of roughing it) we set off on day two. The second day’s walk started flat but we had to cross three rivers either by wading or rock-hopping, depending on size and confidence. It wasn’t long after the rivers that the terrain changed again. Having descended to the river yesterday, this second day involved ascending sharply back up the Black Range. 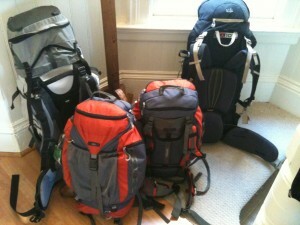 It was a long and relatively tough walk, and one where we thanked the foresight that had us bring walking poles. Morning tea saw us on a saddle from which we then had to give up a couple of hundred metres of hard-won height before once again ascending. Finally we stopped for lunch on the ridge-top and could comfortably sit and look back at the track with a sense of accomplishment. A final eight kilometres, bringing the total to 20, of undulating walk on the ridge-top took us to our campsite. At the end of the Six Foot Track. This second night we were in tents and it was cold, cold, cold. Even with all our layers and snuggled deep into sleeping bags it was a tiring night. The boys, who had kept pace with what Merel described as the fastest group she’d ever guided over the Track, crashed; and Declan could probably have happily slept for a couple more hours on the third morning. The third day was the easiest of the lot. Only ten kilometres and plenty of time. It varied between some of the prettiest scenery as we descended into Jenolan and a far more mundane stretch walking alongside the main road. The boys were thrilled to see an echidna on the track, and even touch it, and we all had morning tea beside a pack of Eastern Grey kangaroos complete with a couple of joeys. Then finally it was a long descent to Jenolan and that great feeling you get when you complete a big walk. Overall the walk was great fun. There’s some lovely scenery and it’s never too hard. 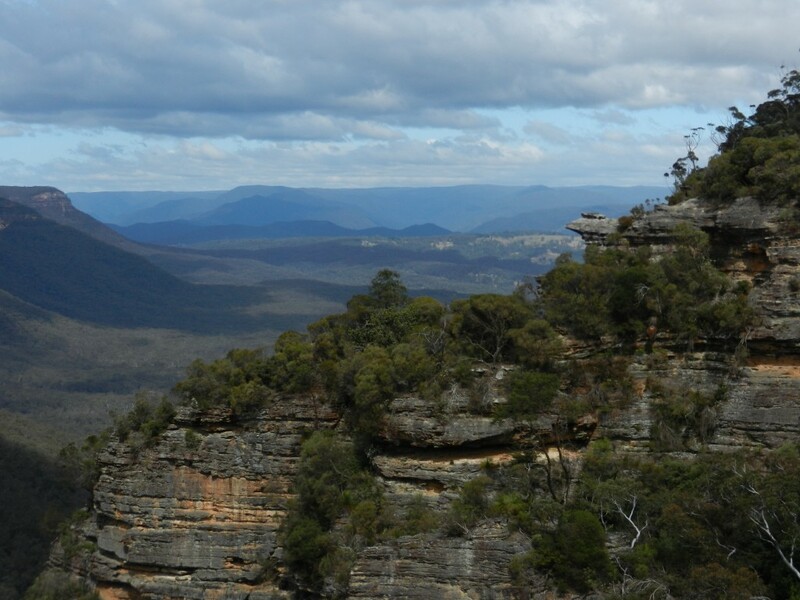 I can’t say it is a stunning walk and it’s shared with too many vehicles at some points to be entirely peaceful, but it is a great way to see a variety of Blue Mountain habitats and have a multi-day walk within reasonable distance of Sydney. For those who might come after: We used Life’s an Adventure to organise the walk and can highly recommend them. At the start of the Six Foot Track. The swing bridge over Cox’s River. Declan crossing the swing bridge. Day two and the Track heads up. Looking back the way we’d come. Day three beside the road.